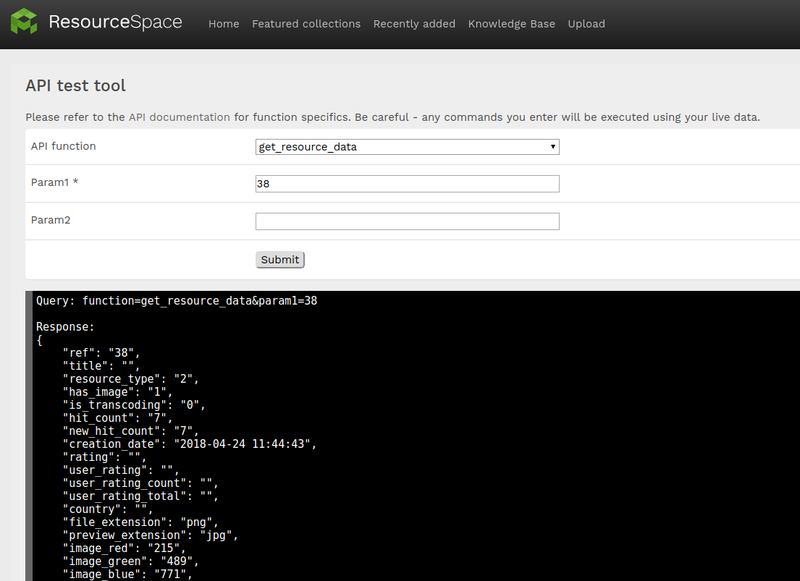 ResourceSpace implements a RESTful API that returns JSON. All requests must be signed using a shared private key specific to each user. This can be performed via GET or POST. The alphanumeric ID of the user to access the system as, for example "admin". The function you wish to perform. See the API function reference for more details. The parameters to pass to each function. These are specific to each function and are documented in the function reference. It's important that the values are properly percent-encoded. If a function has 5 parameters and the developer only needs e.g. param3, then the request must be done like "param1=¶m2=¶m3=value3". The signature. This is generated by taking the private API key for the user (from the user account page in ResourceSpace) then appending the query URL, and finally producing a sha256 hexadecimal hash of that string. This is a GET example in PHP. // Set the private API key for the user (from the user account page) and the user we're accessing the system as. // Make the request and output the JSON results. # Set the private API key for the user (from the user account page) and the user we're accessing the system as. # Make the request and output the JSON results. This is a POST example in PHP. // Set the URL to point to API. // Formulate the API query data. // Sign the query using the private key. // This part simply replicates the GET query string to be POSTed as a single 'query' POST item. // Make the request and output the results. Other languages are possible and would work in a similar way. The API test tool (Admin -> System -> API test tool) allows you to try out commands directly in the ResourceSpace interface prior to inclusion in your development environment. Simply select the function then enter the parameters as defined in the API documentation. The JSON output is displayed below.